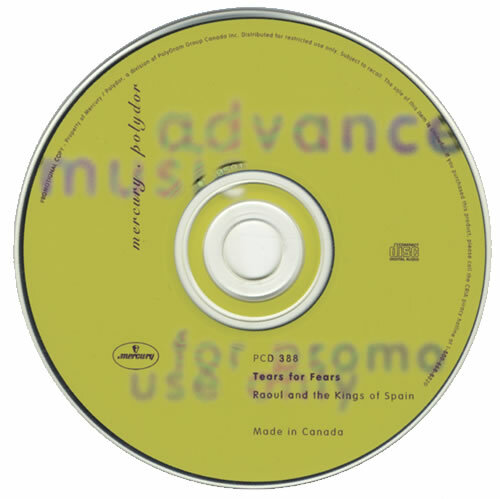 TEARS FOR FEARS Raoul And The Kings Of Spain (Scarce 1995 Canadian Mercury 11-track advance music promotional CD. Track 8 'Queen Of Compromise' became the UK B-side of the Raoul And The Kings Of Spain single and the Japanese B-side of the God's Mistake single. Track 5 'Sketches Of Spain' has the wrong title on this CD and should be 'Sketches Of Pain'. Track 11 'Los Retes Catolicos' is spelt incorrectly and should be 'Los Reyes Catolicos'. Custom printed disc with custom title/tracklisting back insert PCD388).